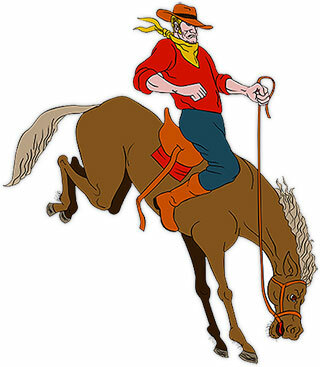 Cowboy animations and clipart images. Category includes animated cowboys, bull riding, gun fighters, cartoons, bronc riding, cowboy hats, cowgirls, covered wagons, boots and cowboy band. The pages are a mixture of animations, clip art images and photos. Cowboy that remembers to tip his hat. A young cowgirl with a lasso and glitter animation. A bad spot to be shot with an arrow. Is there a good spot? A cowgirl with two six guns. Doing a little bronc riding. Suburban cowboy riding a bull. A cowgirl riding a mechanical bull. 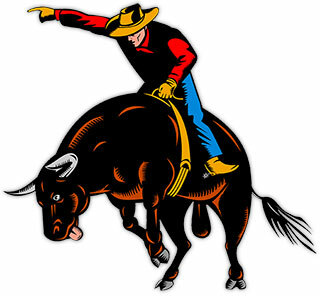 Clip art image of a bull rider. Animated covered wagon on the move. A singing cowboy with his guitar. Cowboy playing poker and keeping a close eye on his opponent. A happy cowboy throwing his hat in the air animation. A first rate country band animated. A singing cowgirl with her guitar. 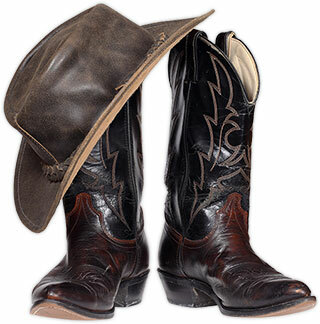 Photo image of cowboy boots and a cowboy hat.